The global anti-infective drugs market is driven by increase in prevalence of infectious diseases across the globe. The global market was valued at US$ 106.5 Bn in 2016 and is projected to expand at a CAGR of 4.2% from 2017 to 2025 to reach US$ 153.3 Bn by 2025. Growth of the market is attributed to increase in digitization of dental practices, high health care IT budgets, and rise in demand for chair time optimization in developed markets. Anti-infective drugs are used for the purpose of killing and/or suppressing the infection causing organisms from invading the host organism by means of replication or releasing variety of toxins in the host. Such infection causing micro-organisms include viruses, bacteria, fungi, viroids, and macro parasites. Infections thus caused can be classified depending on the type of organism causing infection and the symptoms and medical signs shown by host. 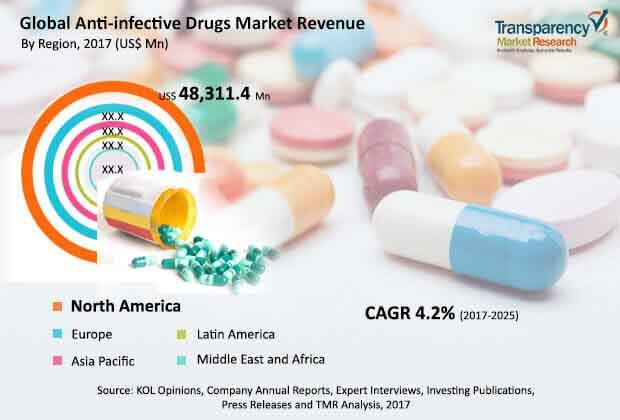 High prevalence and incidence rates of infectious diseases, especially viral infection, and newer drug introductions have resulted in increase in growth of global anti-infective drugs market. These factors are projected to drive demand for anti-infective drugs in the near future. Moreover, rapidly growing antibacterial resistance and unmet medical needs within antiviral therapy are expected to fuel the growth of the anti-infective drugs market. The global anti-infective drugs market has been segmented based on type, indication, distribution channel, and region. In terms of type, the global market has been categorized into anti-bacterial drugs, anti-fungal drugs, and anti-viral drugs. The anti-viral drugs segment accounted for significant share of the global market in terms of revenue in 2016. The segment is expected to expand at a rapid pace during the forecast period. It is likely to gain market share by the end of 2025. This is attributed to increase in prevalence of viral infection, especially HIV infection, hepatitis virus infection, and others. In terms of indication, the global anti-infective drugs market has been classified into pneumonia, methicillin-resistant Staphylococcus aureus (MRSA), sepsis, tuberculosis, dermatophytosis, aspergillosis, candidiasis, hepatitis virus infection, HIV infection, respiratory virus infection, and others. The HIV infection segment dominated the global market and the trend is likely to continue by the end of 2025 with marginal increase in market share. The HIV infection segment is projected to dominate the global anti-infective drugs market as these drugs are administered to patients for the lifetime and new and effective treatments are being introduced. Based on distribution channel, the global market has been divided into hospital pharmacy, retail pharmacy and online pharmacy. Geographically, the global anti-infective drugs market has been segmented into North America, Europe, Asia Pacific, Latin America, and Middle East & Africa. North America dominated the global market and is projected to lose market share by the end of 2025. The region’s dominance of the global anti-infective drugs market is due to factors such as increase in adoption of advanced and high cost drug therapies and significant treatment penetration. Moreover, patients with HIV infection and hepatitis virus infection have increased in the U.S. This is projected to fuel the growth of the anti-infective drugs market in the country during the forecast period. Asia Pacific is projected to be the fastest growing market for anti-infective drugs during the forecast period. India dominated the anti-infective drugs market in the region, whereas Japan is estimated to grow at a high CAGR during the forecast period. Key players in the global anti-infective drugs market include Merck & Co., Inc., Bayer AG, Pfizer, Inc., Gilead Sciences, GlaxoSmithKline plc, Novartis AG, Bristol-Myers Squibb, Sanofi, Allergen plc, F. Hoffman-La Roche Ltd., and Johnson and Johnson. Companies are adopting the strategy acquisition and collaboration to improve and strengthen geographic presence.